Cycling climbing profile of Mont Ventoux from Bedoin. 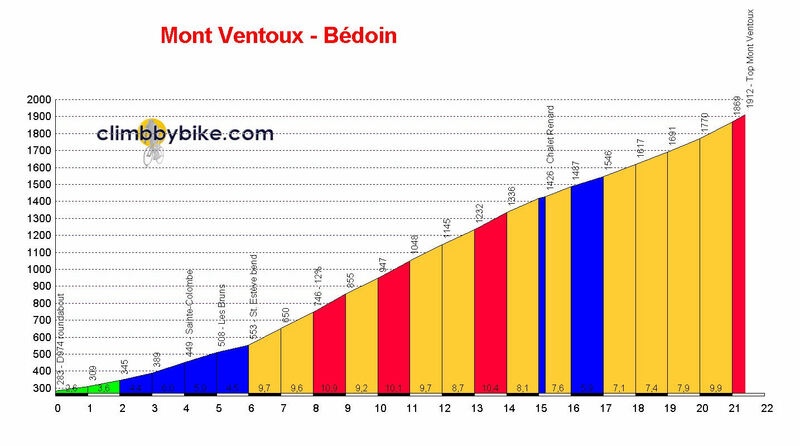 Cycling climbing profile of Mont Ventoux from Bedoin. Mont Ventoux is in the Provence region of the south of France. It is the largest mountain in the region and has been nicknamed the ‘Beast of Provence’. The ascent from Bedoin is the classic way up the mountain and can be broken down in to three obvious sections. It is 5.5km from the village to St Esteve with an average gradient of 4.4%. Beyond St Esteve, the next 9.5km through the forest are challenging, with an average gradient of 9%, though sometimes touching 12%. The last 6km to the summit, whilst on paper slightly easier can be very weather dependent due to the exposure. The last 1500 metres to the top, beyond the Tom Simpson memorial are steep, hitting 10%. Mont Ventoux has been ascended 15 times by the Tour de France, most infamously in 1967 when British Cyclist Tom Simpson died during the race to the top.